Thanksgiving guests will gobble up these turkey cupcakes, which are made with mint patties and sliced almonds. What You Need: 1 cupcake; yellow frosting; 1 thin mint patty (such as by Necco); Junior Mint; about 15 almond slices; candy eyes (or just use mini M&Ms or white icing); red writing icing. How to Make It: Frost cupcake yellow. Place larger mint at center of cupcake. Using dab of icing as “glue,” put Junior Mint on larger mint for head. Add eyes and squeeze small line of red icing for wattle. Arrange sliced almonds in rows behind larger mint for feathers. 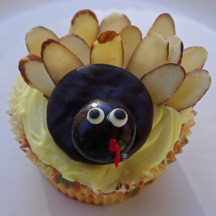 This entry was posted on Tuesday, November 17th, 2009 at 12:13 pm	and is filed under animal cupcakes, Thanksgiving cupcakes. You can follow any responses to this entry through the RSS 2.0 feed. Responses are currently closed, but you can trackback from your own site.